I've recently recorded a few game play video's for Fierce Game Hunting and have found a couple of cool programs that make the process remarkably easy and painless, which is really important if you want to be focusing on the game development rather than video editing. Some see the publishing of progress important for the marketing, others will only publish a trailer once the development is complete - up to you really about how much advanced publicity you're looking to achieve however these techniques are universally applicable. Lets have a look at the initial video capture; for a game that is using DirectX hardware rendering, you will want a program which is going to be able to capture all of the frames in their original glory; it's worth noting that not all screen capture programs handle these sorts of scenarios. One program that handles this really well is TAKSI: Video capture/Screen capture for 3D graphics - Free & Open Source. Taksi takes the hard work out of working out what and how to record and as you probably have a version that runs on your PC (Unless your using Avatars or some such) then you will be good to go. It's a really easy program to use but doesn't appear to be that widely known about. The quality is really good and if your happy with the screen capture, the file can be uploaded directly to YouTube - I've done this with the Fierce Game Hunting - Game Play Preview 2 Video - I wanted to get it up quickly and this is certainly the shortest path to uploading a result. If you want to edit your game play preview (crop & remove some blemishes) & perhaps you want to encode it to WMV or Silverlight Experiences for a better file size before uploading - grab a copy of Microsoft Expression Encoder 4 for Free - that's right, this great product - it's actually free. There is a Pro Version as well and you can see from the Feature Comparison Page there are a few restrictions on the Free version (not the trail for the Pro, the free version :-) such as the video's being limited to 10 minutes and that the full range of input formats isn't available but if your using it with Taksi, you have a perfect match for input formats, quality and editing. Pro's certainly worth considering if your looking to edit much longer video's or you need additional export/import formats, but for those Indie game developers out there, it's probably not a necessarily requirement. Hope this helps some more XNA Indies get the word out about what they have been working on, these programs have helped me heaps and they haven't got the level of recognition they deserve. Fierce Game Hunting is an XNA Game for Windows Phone 7. 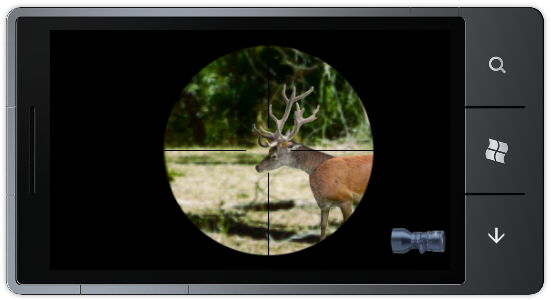 This Game Play Preview shows the opening scene of the game, with Stags being hunted before any firing begins. Preview 2 brings together the elements highlighted individually - Panoramic scrollable backgrounds, the Stag animations and the blending of the environment to demonstrate the opening scene. No weapons previews included in this clip. Note to self: Need to review the possibility to use Expression Blend to build the Animation, after segmenting the image in to a number of layers and then work outta way to save out each of the frames after they have been positioned in to individual frame images. 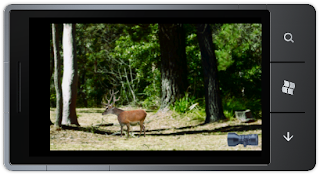 To give a better feel of what I expect this to look like in terms of quality and approach see the following static images, which are taken in the correct aspect resolution for the game - One of the Deer in the woods, another with the scope on and the final image demonstrates the Panorama images being used for the background, which can be scrolled to find and hunt the prey. It's still quite early in the development cycle but keen for any (constructive) feedback. I have received some comments about the way it looks and it certainly has got me thinking about how unforgiving using actual photos actually is - if there is something out of place in a photo it's really noticeable, if it's out of place in a drawing then your eye is more forgiving - I was planning on going for a more humours animation style using the photographic imagery but it seems that this approach has been interpreted as being more serious - which is a great insight in and of itself, meaning that some more unrealistic and fun game play elements should be mixed in, to let the game take it's self a little less seriously.